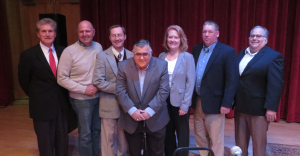 All Town of Webb candidates, that will be facing opposition in the November 3rd election, participated in a question and answer forum at VIEW’s Gould Hall on Tuesday, October 27, before an audience of nearly 100. This entry was posted in admin and tagged view, Webb Candidates on October 29, 2015 by Jay Lawson. The Food Pantry at St. Patrick’s Church in Forestport has received a generous amount of squash thanks to Wagner Farms in Rome and pantry volunteer pickers, and the popular item is going fast. The food pantry serves Woodgate, Forestport, Boonville and surrounding areas and is open by appointment. This entry was posted in admin and tagged food pantry, thrift shop on October 29, 2015 by Gina Greco. Dr. Rebecca Miriam Brakeley Wall and Jesse Eilert Wall were married June 6, 2015 in Newry, ME. 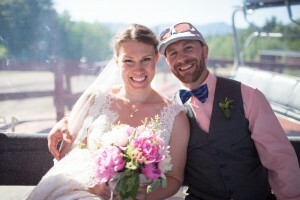 The ceremony took place atop North Peak, at Sunday River Resort. The bride’s uncle, Reverend Dr. Bryan “Bucky” Kashiwa officiated. This entry was posted in admin and tagged Wedding Announcement on October 29, 2015 by Gina Greco. This entry was posted in admin and tagged Poems on October 29, 2015 by Gina Greco. Following is Superintendent Rex Germer’s Report from the Town of Webb Union Free School District’s Board of Education meeting held on October 21st. The regular capsule summary of the meeting, along with Principal Swick’s Report appear on Page 15. New York State Education Commissioner MaryEllen Elia is going to be looking for feedback regarding the Common Core from various constituent groups. This entry was posted in admin and tagged Superintendent's Report, town of webb school on October 29, 2015 by rex germer. This entry was posted in admin and tagged Card of thanks, Pumpkin Fest on October 29, 2015 by Gina Greco. A public meeting will be held in Old Forge at VIEW on Thursday, November 12 from 6 to 8 p.m. to gather input on a regional strategy for diversifying and enhancing outdoor recreation opportunities and improving community connectivity in the “Great South Woods”—a vast area encompassing more than two million acres in the southern Adirondack Park. This entry was posted in admin and tagged Great South Woods, meeting, view on October 29, 2015 by Gina Greco.